40,000 households now have access to up to $6000 in South Australia solar battery subsidies. The solar energy revolution sweeping Australia has gained even more momentum with the recent announcement of an innovative South Australia solar battery subsidy scheme. Premier Marshall has revealed that the state government will offer a ground-breaking $100 million in solar battery subsidies, which will provide 40,000 families in South Australia with up to $6000 to go ahead and embrace the future by installing solar battery systems in their homes. This is a major step forward for solar energy in Australia and the introduction of a solar battery subsidy in South Australia, which will be available to homeowners from October 2018, is the biggest government incentive for battery storage across the country to date. Get an instant sonnenFlat quote sent straight to your inbox in 60 seconds! Click Here! What does this South Australia solar battery subsidy scheme mean for homeowners? Essentially, this South Australia solar battery subsidy means that from October individual homeowners will be granted up to $6000 to help them purchase a battery system such as the sonnenFlat energy storage solution offered by Natural Solar, the largest sonnen battery installer in Australia. The solar energy subsidy offered to each of the 40,000 homes will be scaled according to the size and capacity of the solar battery system purchased. Also, to make the scheme as accessible as possible, solar battery subsidies will be offered on a graded subsidy level that provides more support to lower income households to ensure that solar battery systems are available to all. 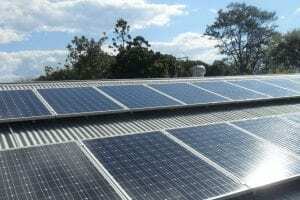 In addition to this, the Clean Energy Finance Corporation will offer $100 million in loans to support the SA solar energy subsidies and ensure that anyone wanting to install a solar battery system, or expand an existing system, is able to do so. Why embrace this South Australia solar battery subsidy scheme? First and foremost, this solar battery subsidy scheme means that 40,000 families in South Australia will be able to dramatically decrease their reliance on the grid by both producing and storing their own energy. This reduced reliance on traditional grid energy, which relies on non-renewable sources, means ultimately a reduction in greenhouse emissions, which is terrific for the environment and helps to protect Australia’s natural resources for the future. But it also means that 40,000 homeowners in South Australia will be well on their way to significantly decreasing their energy bills and moving towards the ultimate goal of a $0 energy bill. 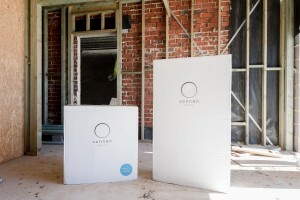 By installing a sonnenFlat energy storage solution such as the ones offered by Natural Solar, the largest sonnen battery installer in Australia, homeowners will receive a set amount of power for free each day regardless of the season in exchange for sonnen having access to your battery for assisting with grid stabilising services. 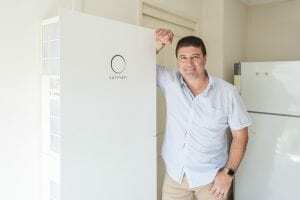 From October, 40,000 families will be able to install the innovative sonnenFlat energy storage solution in their homes thanks to the new South Australia solar battery subsidy scheme. What other benefit is there to the South Australian solar battery subsidy scheme? When homeowners choose a solar battery system, such as the sonnenFlat energy storage solution at Natural Solar, they have the capacity to be recruited into a virtual power plant. Households that take advantage of the $6000 battery subsidy in South Australia will be able to decide if they want their home battery system to operate as part of a virtual power plant that will have the ability to aggregate household solar energy and batteries. Doing so will mean being part of a unique opportunity to help address widespread network issues and smooth issues with energy loads by assisting to balance out energy supply during times of peak power demand. How do I take advantage of the South Australia solar battery subsidy scheme? Homeowners in South Australia who want to take a step towards a future powered by cleaner energy that will save them money need to act quickly as the solar battery subsidy scheme is currently capped at 40,000 homes. sonnenFlat is a clean, reliable and affordable energy storage solution offered by Natural Solar, the largest sonnen battery installer in Australia, and it is the perfect choice for families looking to be part of the solar energy revolution. This highly intelligent home energy storage sonnenBatterie and solar system will provide you with consistent access to low cost energy while also helping to reduced greenhouse emissions. It even makes sure you’re covered during times of high demand by tapping into a network of connected participating batteries. These connect to form a virtual power plant rather than tapping into energy from power stations that rely on energy from non-renewable sources and often require costly upgrades. The solar battery subsidy scheme in South Australia will allow households the option of becoming part of a virtual power plant by installing a sonnenFlat energy storage solution from Natural Solar. The sonnenFlat solar energy solutions we offer are scalable in size and capacity, and the experienced team at Natural Solar can help you to design a system that is tailored to your home and energy needs. Plus you have the benefits of blackout protection, the Sonnen App and online portal that allows you to fully monitor your system, Smart Energy Management software that manages your energy usage throughout the day and the peace of mind of using Lithium Iron Phosphate chemistry, which is both reliable and safe. To find out more about taking advantage of the South Australia solar energy subsidy to install a sonnenFlat energy storage solution in your home, contact our helpful team at Natural Solar today, or fill out the instant quote form below and one of our knowledgeable solar energy specialists will be in touch soon. Get an instant sonnenFlat quote sent straight to your inbox in 60 seconds!